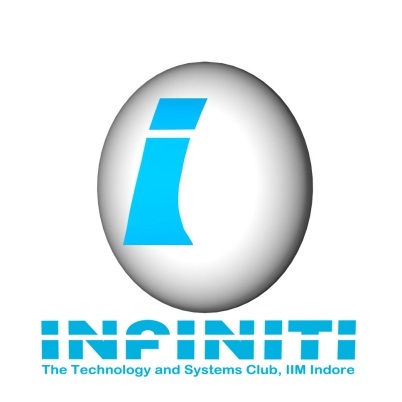 Infinit-I, the IT Consulting and Data Analytics club of IIM Indore, was formed with a mission to appreciate the importance and uses of IT in the field of management. It provides a platform for the participants to interact with the corporate world and builds a strong synergy between them using Live Projects, Consultancy work, Seminars, Workshops, Guest Lectures, Competitions etc. Infinit-I tries to bring about a collaborative environment between the participants, companies and the faculty for mutual benefit. It provides information on the top IT companies that visit IIM Indore for placements. It conducts national level IT Analytics (TechTronix) and case study competitions that tickle the brain cells of participants from top business schools across India to solve real world business problems. IT Bits, the monthly magazine of Infinit-I, highlights the latest trends in the field of technology and creates a platform for students to participate and express their opinions. Infinit-I also manages the SAC Portal – An integrated portal for all club/committee related activities and discussion forum for all information and updates. Given the strength of India’s IT sector, quite a few industry leaders and corporate heads have made it here for guest lectures, seminars and special talks. Some of the well-known leaders include Mr. Sanjeev Bikhchandani, CEO of Info Edge Ltd (Naukri.com); Vibhas Mehta of Shaadi.com; Mr. Natarajan Radhakrishnan, VP of Cognizant Business Consulting; Rajesh Therani, VP of CapGemini; Manish Vij, Co-Founder of Quasar Media; Vivek Bhargava, CEO of Communicate 2; Pavan Chandra, Executive VP of Zenith Optimedia, and Manish Agarwal, VP (Marketing)of Head eCommerce, Rediff.com.